Petunias are flowering annual plants used in flower beds, window boxes and hanging baskets. Ornamental petunias also are used in cut flower arrangements. Two general classes of petunias exist: the multiflora and the grandiflora. Both types may have single flowers or double flowers--with edges that can be straight or ruffled--and come in a variety of colors. Petunias are generally free of insect pests and diseases, but the plants can be affected by viruses and damping-off, according to the University of Rhode Island Landscape Horticulture Program website. Several viruses can affect petunias. The most commonly detected and most destructive virus is TMV, or tobacco mosaic virus, which can be severe or mild. Mottling of the foliage is the primary symptom of TMV, along with stunting and deformation of the leaves. Another sign is color-breaking, which causes streaks or patches of darker or lighter colors, breaking up the normal color of the flowers. One TMV-infected petunia can destroy a whole crop in a few days. A virus that is a close relative of TMV is ToMV (tomato mosaic virus), which has similar symptoms but it is not as easily transmitted. Other viruses that may affect petunias are ToRSV (tomato ringspot virus) and TRSV (tobacco ringspot virus). Both viruses are closely related and show similar symptoms such as ringspot. Phytophthora (phytophthora parasitica) root and crown rot are soil-borne organisms and are common problems affecting bedding plants such as the petunia. The fungus attacks the base of the petunia and is evidenced by dry rot near the soil line. Rot can also appear on one side of the petunia or on lateral branches. The roots of the petunia may not show excessive rotting, but the roots will not grow as large as they should. The fungus generally occurs in beds where the same plant species is planted year after year. It can survive in the soil indefinitely, according to the Utah State University Cooperative Extension website. Damping-off also can affect petunias and is caused by soil-borne organisms. 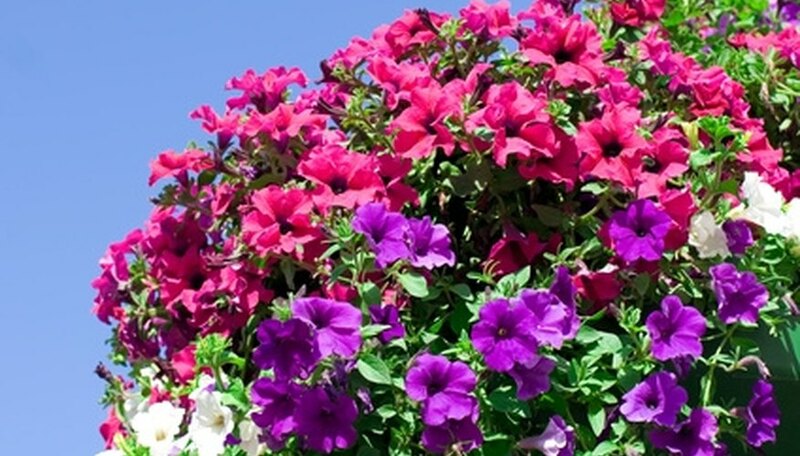 Two types of damping-off are known to affect petunias. According to the Connecticut Agricultural Experiment Station website, the pre-emergence type of damping-off happens when the germinating petunia seeds rot before they break through the soil. The post-emergence type of damping-off happens when the petunias emerge and then wilt or topple over.